One of the first steps towards self leadership is awareness. There’s the story of the disciple who went to the master and said, “Could you give me a word of wisdom? Could you tell me something that would guide me through my days”? It was the master’s day of silence, so he picked up a pad. It said, “Awareness”. When the disciple saw it, he said, “This is too brief. Can you expand on it a bit”? So the master took back the pad and wrote, “Awareness, awareness, awareness”. The disciple said, “Yes, but what does it mean”? The master took back the pad and wrote, “Awareness, awareness, awareness means – awareness”. Without awareness how will we be able to answer these important questions? What triggers strong emotions within you? How you have acquired certain patterns of behaviour? What you need to live a fulfilling life? The good news is that all of us have been gifted with self-awareness. For a variety of reasons, we choose not to use this gift. But the other bit of good news is that we can train or retrain ourselves to become more aware. One challenging exercise in awareness is to write your own eulogy. Yes, imagine yourself dead and someone speaking about your life. What might they say about who you were, how you behaved and what you achieved? What you write will tell you a lot about your values. You might find this a difficult exercise, but I know from experience how helpful it is. Perhaps you could share this with a friend and have her or him tell you if this rings true about you. Have your friend or a member of your family whose opinion you value, tell you what they think about you and your behaviour. How do you come across to them. Be open to have them tell you something you may not like about yourself. Remember, the more we are aware, the more we can grow and the further along we can go on our journey in self leadership. ” a wonderful exercise in awareness. I have discovered the source of many of my negative patterns of behaviour through it, as also what I can do to heal myself and move forward. Some very powerful words from Osho. Today I wish you awareness! Stay tuned for the ‘B’ of Self-Leadership. Today I’m on ‘A ‘ of the Blogging from A to Z April Challenge. My theme is the A to Z of Self Leadership. I’m also undertaking the NaBloPoMo for April – the theme is ‘grow’ and the Ultimate Blog Challenge. I don’t necessarily agree with Osho about there being no evil/forces (since that is the opposite of what the Bible teaches) but I like his point. People are asleep and it does lead to their destruction! This was an excellent, excellent article! I am going to (again) save this one and do the homework!! I like this series you’re doing even if I am behind – now I have several in a row to read, yay! GREAT post! Interesting Corinne. I’ve done a lot of changing in the past year, taking in many of the points above, although not writing anything down. I think deep down we all know what we want, who we are. It sometimes takes a loss or illness to get in touch with it though. I don’t agree with Osho. I feel if people were truly aware, they wouldn’t be unkind, cruel etc. Just my own take on that one. Oh God! If I were to try the eulogy experiment, i’d get nowhere Corrine!! I know so little about myself. That’s always been the problem with me, making me one real confused(and sometimes confusing) individual. I really must work on self awareness. Lovely post! So true!! Any kind of personal growth can only begin with a true awareness of one’s self. I’ve read about the eulogy exercise before, but it sounds difficult (and also feels a little morbid :)) But I think that is one reason it is so effective! Try the eulogy exercise, Fab! It’s really not morbid, considering we all have to die someday! 😉 But seriously, you could try the exercise in The 7 Habits – imagining your 80th birthday. Having awareness is a powerful tool indeed. Such a lovely post. Thanks for sharing, Corinne. YES. This is part of prayer, Corinne. I wish there wasn’t, but there is. Thanks, Kim. I think Osho was saying that evil is a lack of awarenes of our feelings and those of others. Glad you like it, EM. I’m writing it for myself, first of all! An inspiring theme, Corinne and some great tips. Writing my own epitaph sounds interesting although a bit daunting. You got me there Corinne :O Writing my Eulogy is such a scary feel. Very powerful post. Awaresness of who we are and where we are going can change our life. Corinne this is beautiful. I look forward to your words throughout the challenge. Good Luck! Thanks, Doreen! I was just discussing your blessing bags with my husband! Good girl, Swathi. Let me know how it went! Self leadership—I love this subject. It’s taken me many years to reach it and find self awareness. When it begins to happen though, our confidence is increased and we feel we can do almost anything. Lovely quotes you’ve shared too, Corrine. Thanks for the inspiration. I think self awareness is an ongoing exercise, and like you say, one that is so necessary for us to be confident. Thank you for coming by, Lisa! Thanks, Rachel. You’re so right – without awareness there can be no growth. Loved it. Needless to say well written. Am unsure, what would they speak if I am no more. Oh! it has made me halt! I would want to ponder on how I have carried myself all these years. Thanks, Ajay. I suppose we can only imagine what people will really say. But what do we want them to say? That will perhaps guide the course of our life. Being aware is so vital for our well being. Thanks for reinforcing this with your post. A great post to start the challenge with. You’ve made yet another impact on me and how I look at things! I’m so guilty of not being aware of what I am feeling, experiencing, wanting, etc., so, I’m off to write a eulogy. Would love to read it when you’re done, Robyn. Let me know how it went, Prasanna! Thanks, Vinitha. Would love to take a peek at what you write for your ‘eulogy’. Great post! Very thought-provoking. I think finding out what other people really think about you is one of the scariest things in the world 🙂 But probably very useful.Thank you! I’m glad you liked The Artist’s Way, Sulekha. I hope you enjoy the exercise I suggested too! Thanks, Aathira. Do share what you’ve been reading! 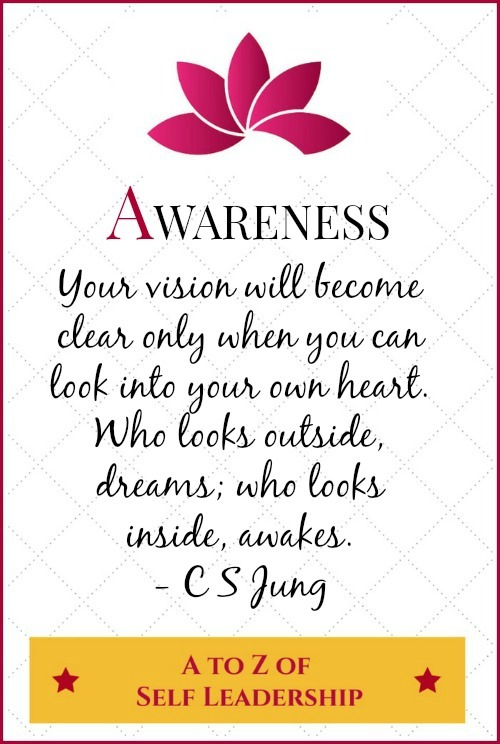 Love the quote by Carl Jung – he summed it up well. All answers lie within. Interesting thought to write a eulogy. All answers lie within, indeed! The paradox is that we keep searching…! I’m sure your yoga practice helps you become more aware, Raj! Great start Corinne and I agree it all begins and ends with awareness. Writing a Eulogy is a great idea and I should try that. Thanks, Parul. Let me know how your eulogy writing goes! Self-awareness is hard. I do agree with much of your post :). I think I might find trying to write my own eulogy a bit morbid, however :). Thanks, Angela. I know you would tell me about Osho’s writings when I hadn’t really looked at them. I don’t think we did the eulogy exercise together, but I found it immensely useful too. I played with Awareness for A, Corinne – but opted for another word, as it seemed more apt. What a wonderful start to the A to Z – and I love your pinnable! I remember you once tagged me on twitter – 5 last words or something, remember? That was fun – and I thought of it today when I read your post. A regular exercise I enjoy is this: ask 5 friends what they think of you in one-three lines. Great fun! I’m glad we didn’t do the same word, Vidya. Yes, I remember that twitter thing. And thanks for sharing that exercise. It is fun and an eye-opener too! Excellent tips about self-awareness. I remember doing that eulogy exercise in Journalism school. It does help you realize your self-worth. Ah so you know how that exercise goes, Debbie. I was surprised by how many people think it’s morbid! Such a wonderful theme for the AtoZ Corinne! The idea of writing my own funeral speech is kind of unsettling. You are right, it shows you what you want to be and throws light on what you need to do. Indeed. Unsettling in a good way. It makes you want to finally get up and get moving..
A great start Corinne! It is strange that we may know a lot about the world yet remain unaware of ourselves. I’m not sure I’ll be able to write my own eulogy, but I’ll definitely make a friend do it 🙂 I am actually thinking of doing similar activities with my students in school! That’s right, Pratikshya. I remember Rumi’s words, something to the effect of searching for a precious necklace when it’s on your next all the while! I love the idea of writing our own eulogy. Great idea. I wrote a post a while back about how our life is a painting and what does your art gallery look like. It was kind of the same concept. We need to live our life how we want to be remembered. Love life, love ourselves and paint your image for YOU and OTHERS! Thanks for inspiring doll. Talk to you soon. Keep that beautiful smile of yours shining bright. I love the metaphor of the art gallery. Thanks for sharing, Irish, and for all your encouragement. You’re a sweetheart! Good post Corrine. Looking forward to all the other alphabets. I had not revealed my theme but since I am participating through my food blog my theme will revolve around ingredients and all the names related to food, cuisine and all that. Thanks, Swati! Good luck with the challenge. I’ve been doing a few posts on food recently but haven’t had the courage to start a food blog! Whoa! SUCH a cool theme! I think I’m gonna have to follow these. I tend to be pretty self-aware. Or perhaps more self-analytical (when I notice – cos I know I can sometimes be IMMENSELY dumb about things (but perhaps we all can)). The idea of writing my own eulogy was VERY odd, but I can see how it would highlight the things which are important to a person – same as looking at your bank statement to see what you invest in. Very well written, Corinne. What you said about writing our own eulogy is very true. We had our Communications professor give it as an assignment during MBA – Write your own Funeral Speech. Even after all these years I recollect how difficult it was and how strongly it impacted me. Staying tuned for B. So you know the feeling? The exercise made me much more conscious of what I was and wanted to be, Shantala.